Is eating healthier your new years resolution? Detoxing after the holidays? I’m not sure anyone actually does this but if fitness club attendance is any indication, it would seem so. I always plan on eating healthier but never actually do it. Food is just too much fun. 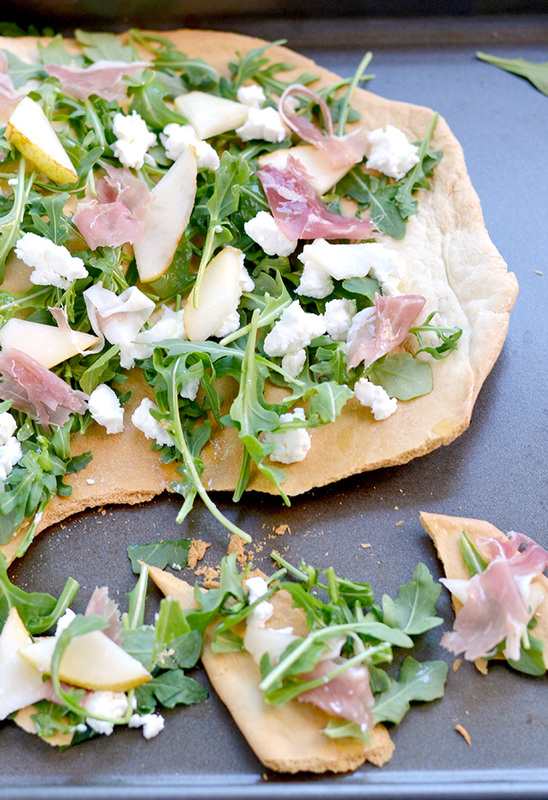 This Arugula, Pear, and Prosciutto Flatbread with Meyer Lemon Dressing is my version of eating healthy. It’s light, simple, and of course, tasty. It’s hard to believe 2015 is almost over. We actually made it through the famous year from “Back to the Future” and we are on our way to 2016. The year seemed to fly by but when I reflect on the changes that occurred on this blog, in my life, and even around the world, 2015 has actually been a pretty long and busy year. In the little world of this blog, a lot has changed. Actually, everything changed. 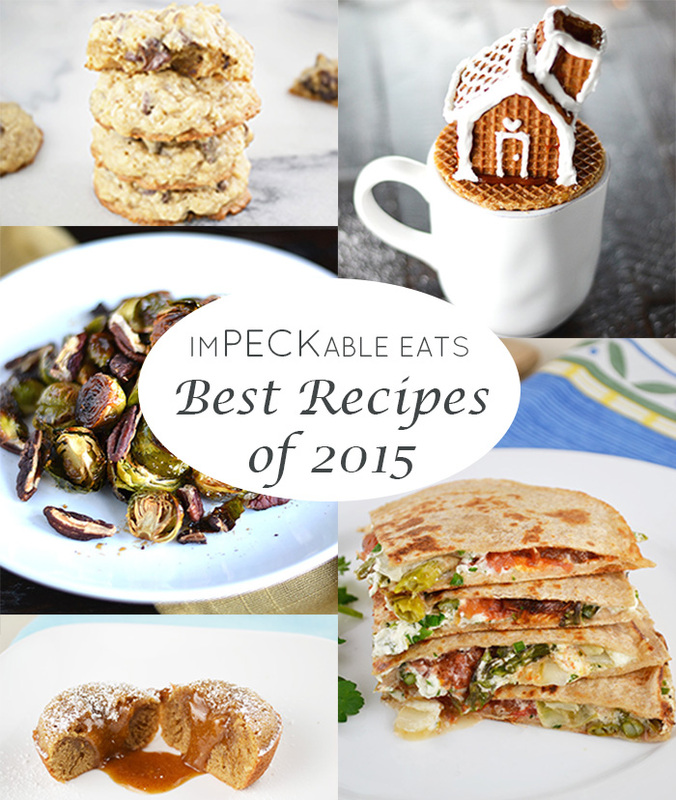 Megan Peck Cooks became ImPECKable Eats. A new name, a new look, and a new feel but the same delicious recipes. I decided to expand beyond my grandmother, Paula Peck’s, lovely recipes into additional classics and modern twists. Chocolate and chestnut, what a pair! As mentioned by Nat King Cole in The Christmas Song, Chestnuts roasting on an open fire are a holiday favorite. But over the years, chestnuts seem to have become less and less prominent. Frequently seen at most street carts around New York during the holidays, I have yet to find one this year. Maybe because most Chestnuts now come from Asia or maybe it’s just the trend life cycle. A whole article could easily be written on the history of chestnuts. I’m just here to share this delicious chocolate chestnut slices recipe. I’m not usually the DIY type but how cute are these?! They have little to do with classic recipes (or the focus of my blog) but I couldn’t help sharing these stroopwafel non-gingerbread gingerbread house mug toppers. The name isn’t the only mouthful – these little houses are made from stroopwafel, the caramel cookie often used as a hot beverage accompaniment (learn more about stroopwafels in this cool Huffpost article). These round dutch cookies sit on top of your tea or coffee mug. 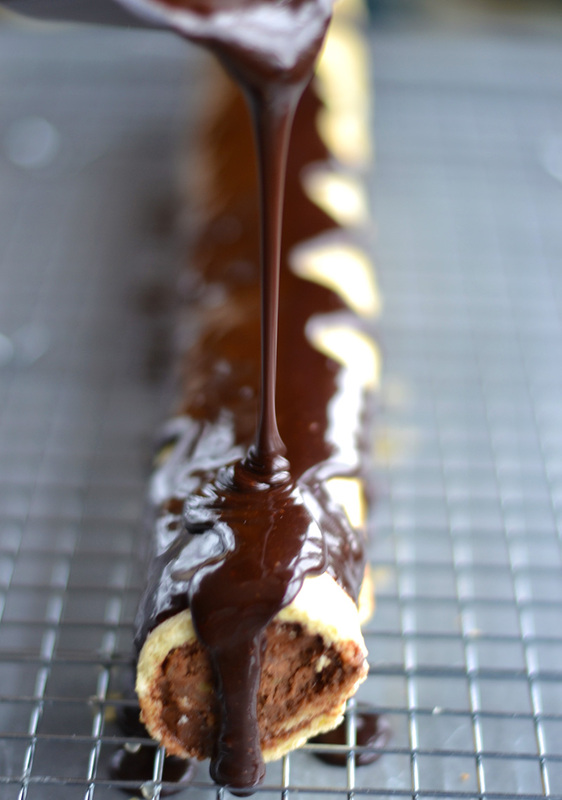 The steam softens the caramel center, creating an ooey gooey sweet treat. Alone, they are a tasty complement to hot coffee, tea, or even hot cocoa. 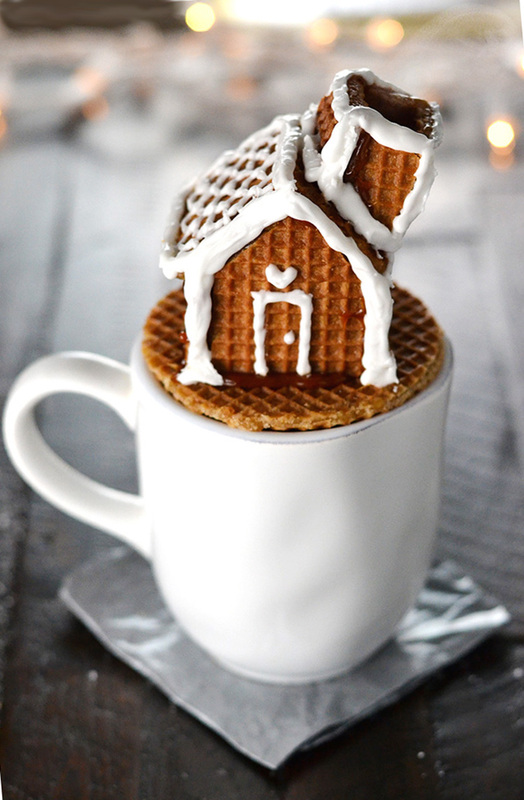 As a stroopwafel mini mug topper house, they just might be the cutest (yet functional) holiday mug topper ever. Yes, ever. Even the chimney works – if you look closely at the photo you can see the steam coming out. Sweet potato again?! I might be enjoying pumpkin and sweet potatoes a little too much this year. Although this starchy vegetable is usually served at Thanksgiving, it’s broadly used throughout fall and even the holidays. Since it still feels like fall in the Northeast, why not continue to enjoy this naturally sweet versatile veg? Even grocery stores often sell sweet potato pie until Christmas. 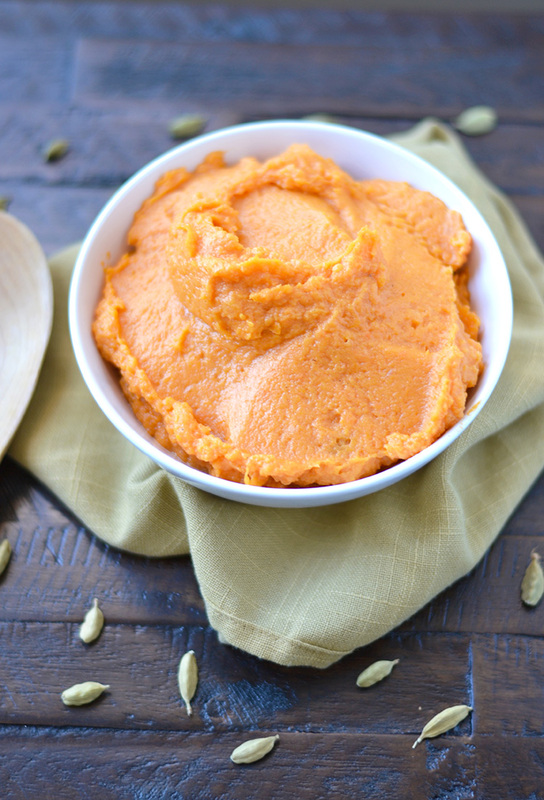 But with so many ways to prepare sweet potato, it’s hard to choose just one go-to recipe. These easy Cardamom-Scented Whipped Sweet Potatoes are a delicately sweet twist on an average dish, I couldn’t resist serving a mound of it alongside roast chicken.